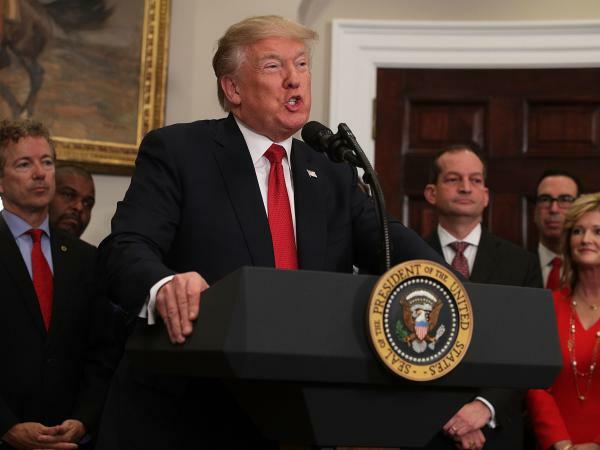 President Trump talks Thursday about an executive order to ease the way for groups of employers to offer health insurance. Later, the administration said it would halt subsidy payments to insurers. President Trump's decision Thursday to end subsidy payments to health insurance companies is expected to raise premiums for middle-class families and cost the federal government hundreds of billions of dollars. The administration said it would stop reimbursing insurers for discounts on co-payments and deductibles that they are required by law to offer to low-income consumers. The reimbursements are known as cost-sharing reduction payments, or CSRs. Insurance companies still have to give the discounts to low-income customers. So if the government doesn't reimburse the insurers, they'll make up the money by charging higher premiums for coverage. The subsidy cut was the second swipe the White House took at the Affordable Care Act insurance markets Thursday in what many critics say is a deliberate campaign to destabilize them in hopes of forcing Congress to repeal the law. "Ending the CSR payments is another sign that President Trump is doing what he can to undermine the stability of the individual market under the ACA," wrote Tim Jost, professor emeritus of law at Washington and Lee University who contributes to the Health Affairs blog. The decision will most directly affect middle-class families who buy their own insurance without financial help from the government. Consumers who earn more than 400 percent of the federal poverty level — an individual with income of about $48,000 or a family of four that makes more than $98,400 — will likely see their costs for coverage rise next year by an average of about 20 percent nationwide. People with lower incomes will be unaffected since the ACA, also known as Obamacare, provides government subsidies — in the form of tax credits — that ensure their out-of-pocket insurance costs remain stable. So when premiums rise, those tax credits rise in tandem. "We now know what Trumpcare looks like, and it's pretty ugly," said Ezekiel Emanuel, an oncologist who chairs the Department of Medical Ethics and Health Policy at the University of Pennsylvania. "The people who are particularly going to hurt are the people who don't get any subsidies. They just have to buy their own insurance," Emanuel, one of the architects of the ACA, told Morning Edition on Friday. Ironically, the decision to end the $7 billion-a-year cost-sharing payments is likely to cost the federal government more than making them — nearly $200 billion over 10 years, according to the Congressional Budget Office. That is because the ACA requires that premiums don't exceed a set percentage of a person's income. So as premiums set by insurance companies rise over time, the government has to boost its tax credits so the cost to the consumer remains the same. Last year, about 85 percent of people who bought Obamacare insurance got a tax credit, according to the Centers for Medicare and Medicaid Services. The cost-sharing payments have been at the center of a political battle over the Affordable Care Act since before Trump took office. House Republicans opposed to the health law sued then-President Barack Obama, saying the payments were illegal because Congress hadn't appropriated money for them. A judge agreed but allowed the administration to continue making the payments during an appeal. The president has been threatening all year to cut off the payments, which he refers to as a bailout. He repeated that characterization on Twitter on Friday. Insurers have been left to wonder, month to month, whether they will receive them. The White House cited that legal dispute when it announced the end of the payments late Thursday. "The bailout of insurance companies through these unlawful payments is yet another example of how the previous administration abused taxpayer dollars and skirted the law to prop up a broken system," the White House statement said. The decision to end the cost-sharing payments came just hours after Trump signed an executive order hoping to make it easier for people and small businesses to buy cheaper health insurance policies through trade groups and professional associations. Those plan would likely have fewer benefits and appeal to healthier, younger people. The two moves Thursday could split the health care market. People with low-incomes or expensive medical conditions like diabetes would stay in the ACA marketplaces, while healthier, wealthier people would go elsewhere for coverage. The result would be higher costs for people who need health care most.